Seventeen year old Veronica “Ronnie” Miller’s life was turned upside-down when her parents divorced and her father moved from New York City to Wrightsville Beach, North Carolina. Three years later, she remains angry and alienated from her parents, especially her father…until her mother decides it would be in everyone’s best interest if she spent the summer in Wilmington with him. Ronnie’s father, a former concert pianist and teacher, is living a quiet life in the beach town, immersed in creating a work of art that will become the centerpiece of a local church. The tale that unfolds is an unforgettable story of love on many levels–first love, love between parents and children — that demonstrates, as only a Nicholas Sparks novel can, the many ways that love can break our hearts…and heal them. I’m a huge fan of Nicholas Sparks’ books: the plots are interesting and well-thought out, the characters well-developed, the writing style so real yet poetic and there are always some powerful messages and life lessons in them. And the last song is no exception. It is also a tear-jerker so keep your handkerchief close, you’ll need it. The Last Song is the story of Ronnie’s coming of age, her first love and the difficult relationship between parents and children. Ronnie is a seventeen year old girl going through her rebellious stage. Her parents divorced three years ago and her father Steve, who is an ex-pianist, moved from NYC to a small beach town in North Carolina, where he leads a very simple life. Ronnie has never forgiven him and has never spoken to him since. And when her mother suddenly drops her and her brother Jonah, who is a very funny little boy, on his doorstep because she thinks they need to spend more time together, Ronnie isn’t happy and shows it. She tries to avoid her father as much as possible and makes it clear she wants nothing to do with him. I was really annoyed by such childish behaviour, yet Steve is very understanding, gives her the space she needs and trust her even when no one else does. Despite this though, I like Ronnie. Her character is real, strong and believable. She makes some bad decisions like hanging out with the wrong crowd which lands her in trouble, but she learns from her mistakes and we see her growing from a rebellious teenager into a lovely young woman. During the summer, Ronnie also falls in love for the first time. Will is not only handsome and rich, but also lovely, kind and a true friend. The story is told through the points of views of Steve, Roni and Will, which could have been very confusing, but Sparks has written it in such a wonderful way that all these different perspectives just make you understand the story better instead than hinder it. Although the book is quite slow at the start, it soon picks up speed as Roni lives the summer she will never forget and that will change her life forever. A summer in which she’ll learn very important lessons. She will become an adult, learn not to jump to conclusions, learn that life isn’t black and white but lots of shades of grey, learn to love and learn to forgive.. Sparks has a way with words that just pulls at your heart strings. This book will make you cry, laugh and think. Overall, a very emotional read that I highly recommend. 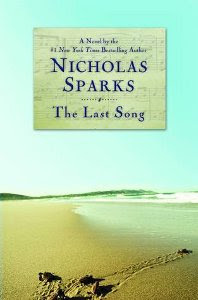 The Last Song By Nicholas Sparks is a very emotional book. It tells the story of Roni, a rebellious teenager who hates her father but is forced to spend the summer with him. It will be a summer full of tests, trials, pain and joy that will change her life forever. I also love the writing style, it’s so real yet poetic. Overall, a wonderful and highly-recommended read.